First of all, the name itself intrigued me- Meisterstuck. This persuasively sounds royal and classy. And when a brand like Montblanc has been affixed to this intriguing name, I couldn’t help myself but start a talk about how awesome and tempting this series of writing instrument is. So, what makes Meisterstuck so irresistible? 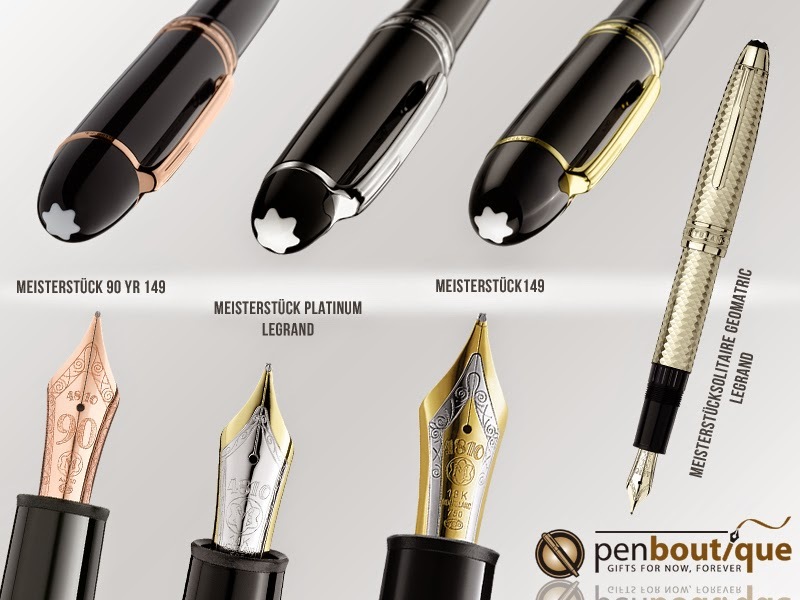 I’m sure a lot of alike-minded pen enthusiasts who have had an encounter with Montblanc M145P Meisterstuck Black Classique Platinum Plated Fountain Pen or Montblanc Meisterstuck Legrand Gold Plated Rollerball Pen or any other lucrative device from this category of fine pens can give you a satisfying answer. The reasons are the same as that which makes it one of the bestsellers at our pen shop. Is it the slim shape, the lightweight, the simplicity, the exquisite nib or the dependability? Narrowing down to one aspect is quite tough a job. For the past century, Montblanc has been synonymous to the plush writing culture and has effortlessly maintained their time-honored craftsmanship and quality depicting themselves as the best pens for writing. Compare on the basis of materials, artistry and compliance, Montblanc Meisterstuck will come second to none. It possesses the power of touch; a touch from the experts from Mont blanc that has transferred in the timeless expertise, the soul of the masters. Meisterstuck meaning Masterpiece in German; the name was conceived in 1924 and has been casting a spell ever since. 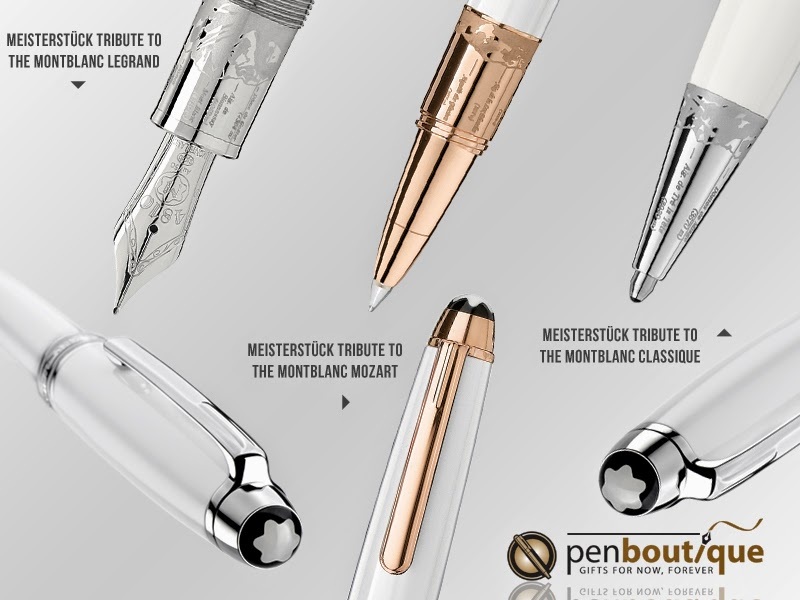 With each passing year, the technology developed and the designs modified but every single masterpiece still echoes absolute silence and patience in the company of which the experts at Mont blanc carry out hundreds of steps to fabricate the perfect nib for you. Hand-crafted in European tradition, the two toned 14K gold nib with rhodium or platinum inlay graces the Montblanc fountain pens such as Montblanc Meisterstuck 149, Montblanc Meisterstuck Platinum Line Le Grand Fountain Pen, Montblanc Meisterstuck Solitaire Stainless Steel Fountain Pen, and the list of equally lavish fine writing instruments can go on without any hustle. But I will have to take a break to acknowledge the twist-action fluent Ballpoint Pens - Montblanc Meisterstuck Classique Soltaire Royal Ballpoint Pen(also available in Black and Gold and Black and Platinum) being the most sought after; fluid Rollerball Pens, most of which is convertible to fine liners such as MontBlanc Meisterstück LeGrand Rollerball, Gold or Platinum and the Mechanical pencils that come in various sizes as per your need. Pick from either Gold or Platinum Meisterstuck Classique Mechanical Pencils that are available in 0.5mm and 0.7mm. If you are willing to purchase a bolder one, Montblanc Meisterstuck LeGrand Mechanical Pencil - 0.9 mm can fulfill your requisite. And oh yes, the modern series includes even a highlighter pen, Montblanc Meisterstuck Legrand Document Marker Gold Trims, makes sure you don’t miss out anything important. Though it appears as a regular fountain pen, the minimalist design hides under it the epitome of luxury. In the recent times, Mont blanc has emerged as a lifestyle brand and it has developed as a nobility to own a timelessly substantial accessory like Meisterstück. The barrel exudes history and value through the deep black precious resins or the Solitaire- platinum and steel plating. 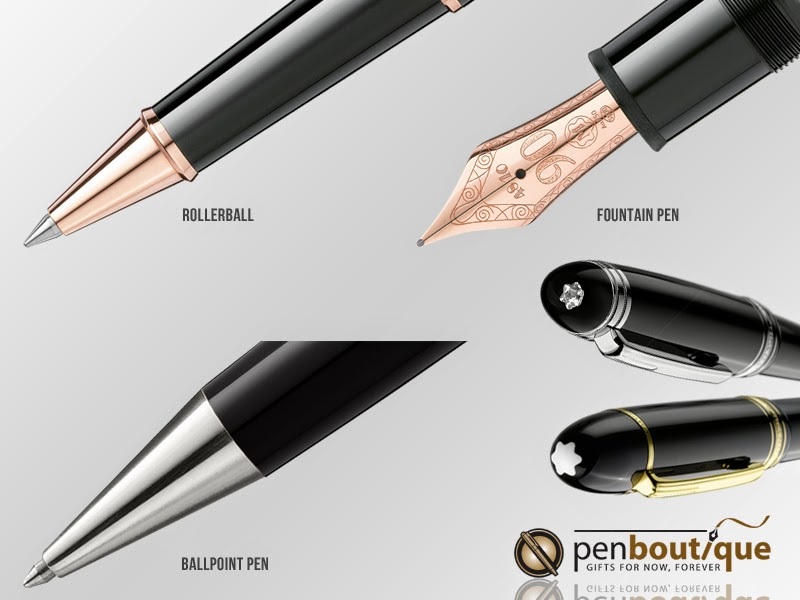 This series of luxury pens embraces a simple platinum-plated or gold clip with a carved individual serial number. 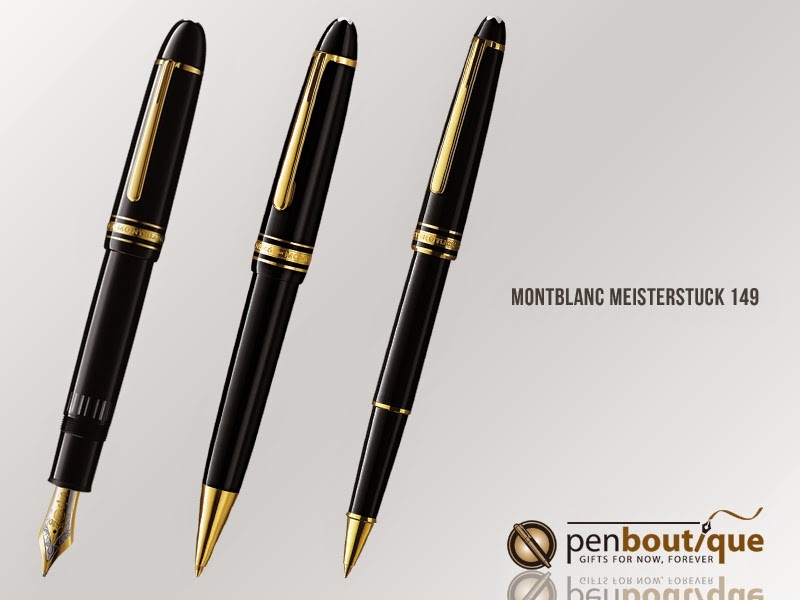 The splendor is doubled by the precious metal plated rings on the cap and barrel, and also the trim where a broader middle band catches the eye with an engraving of “Montblanc Meisterstück Pen” the highly valued Mont blanc brand name. The top of the cap is rounded imitating the bottom and stands out because of the distinctive white star emblem surmounted by a dome of transparent resin. This emblem represents the snow capped peak of the Montblanc Mountain. Based on the operation technique, the Meisterstück series of Fountain Pens can be categorized on the basis of their filling system. 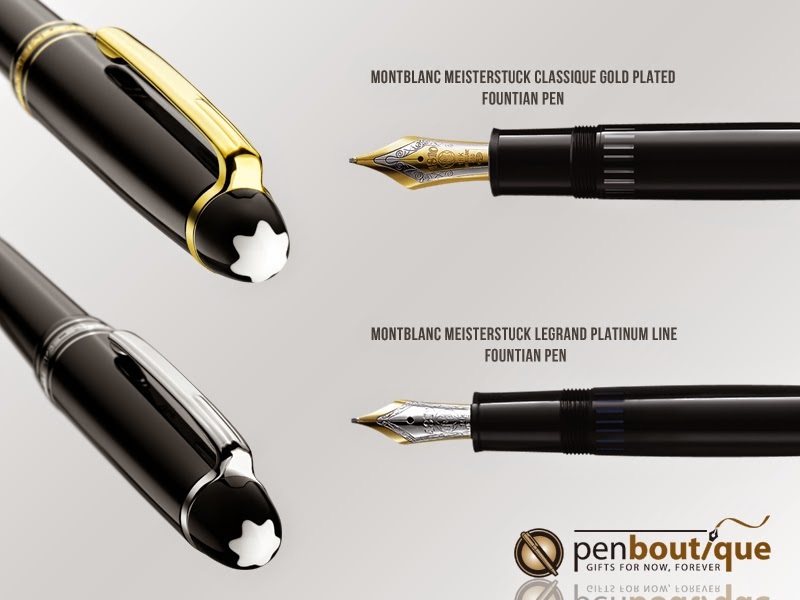 Montblanc Meisterstuck Legrand Fountain pens which are modern and bigger version to the Classique series, are Piston Fill Fountain pens; except for the Meisterstuck Legrand Traveler Fountain Pen with gold trims that constitutes of a gold plated cartridge filling system. Meisterstuck Classique Fountain Pens, inclusive of Platinum Line, Diamond Classique, Solitaire Doue Geometric Dimension, Carbon and steel, and Solitaire Doue Stainless steel; function by means of Piston converters that also allows the optional use of ink cartridges. Each pen comes with the direction ‘Use Montblanc Ink only’. For your masterpiece, you can always discover the ultimate choice of inks at Penboutique, an authorized dealer of Montblanc. You can also find out about the new arrival Mont Blanc Inks right here. Or Watch the video for Montblanc Ink Review. Meanwhile, explore the wide range of Ballpoint Refills, Rollerball Refills, Marker Refills, Pencil Refills, Converters and more. Celebrate the Spirit of Meisterstuck, with a unique selection of meticulously crafted writing instruments, jewelries, time pieces and leather goods. This collection commemorates the 90 prestigious years of iconic Montblanc Meisterstuck and brings forward icons of future. Embracing a pristine heritage, the Montblanc Meisterstück 90 years Collection captures the essence of timeless penmanship through the quintessential Montblanc 90 years 149 Fountain Pen, Montblanc 90 years Classique fountain pen/ Classique Ballpoint Pen/Classique Rollerball Pen and Montblanc 90 years LeGrand Fountain Pen also available in Ballpoint and Rollerball. With a toast to the 90 years it has come by, and to more of such 90 years to approach, Montblanc made the celebration GRAND. Here is how they did it. While talking about masterpieces, one could hardly overlook Montblanc Meisterstuck 149, an iconic pen that has been topping the charts, literally on search engines and blog reviews of the fine writing instruments in this category. The pen boasts of a hand crafted Au 750/ 18K gold nib with rhodium plated inlay, combination of which is flawless against precious Black resin or the Solitaire Platinum, regulars or special Diplomat Version. The other remarkable aspect is it’s presentation; it comes in a luxurious box including Mont blanc Ink as an additional gift. How thoughtful! Just a matter of fact, the number 149 is not random as it might sound. The numerical 1 indicates that the pen is a strain of Meisterstuck. 4 stands for telescope piston mechanism and 9 denotes the size of the nib that goes down to the smallest size no.1. You might opt for a less substantial but equally estimable Montblanc Meisterstück 146 that constitutes a medium sized nib which is 18K with platinum inlay and of course, hand crafted. Montblanc soars the heights of luxury and recognition but keeping itself planted to its roots, the brand pays a tribute to a prolific composer of classical era through the series of supreme writing instruments called "Hommage à Wolfgang Amadeus Mozart." The Meisterstück Mozart Jewelry Collection, consisting of three exclusive models - platinum plate, an engraved white lacquer pen with 18 karat rose gold, and a champagne-colored gold pen decorated with diamonds are the ultimate examples of femininity and extravagance. With time, their discreetly unassuming versions were launched that were an instant hit and they still are much admired and much acquired. Montblanc Meisterstuck Hommage WA Mozart is available in both Black and Gold and Black and Platinum - Fountain Pens, Ballpoints, Rollerballs and Mechanical Pencils. This collection is another fascinating reverence reinterpreting the legendary brand of Montblanc. By the help of half a dozen adherent snow peaks – the polished snow quartz emblem on the cap of the pure and precious white lacquer cap and barrel dedicates itself to the symbolic mountain, Mont Blanc. 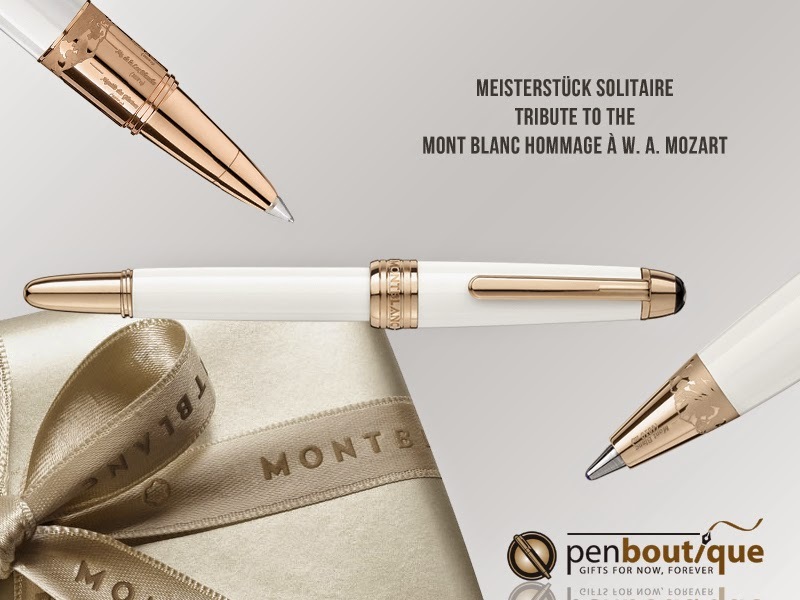 The Montblanc Meisterstuck tribute to Montblanc Pen is significant with Gold trims or Platinum trims or the Solitaire Line. It constitutes of a rhodium-plated 18K gold nib however, the Mozart Tribute encompasses the 18K rose gold nib. Each collection is completed with a matching Rollerball and Ballpoint Pen. Every piece of this collection shines with the “Tribute to the Mont Blanc” signet. 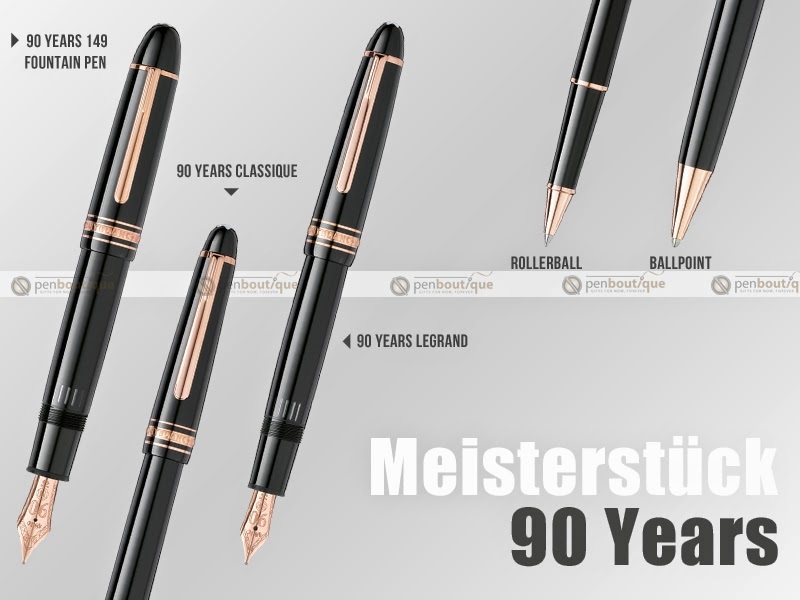 I am now, writing my next book…and I write all my notes with the Meisterstuck, of course. Montblanc Alfred Hitchcock Limited Edition Pens-"Thrilling from Barrel to Cap"
We would love to hear from you. Do comment! Spring is in the air, so is the Cherry blossom fragrance. 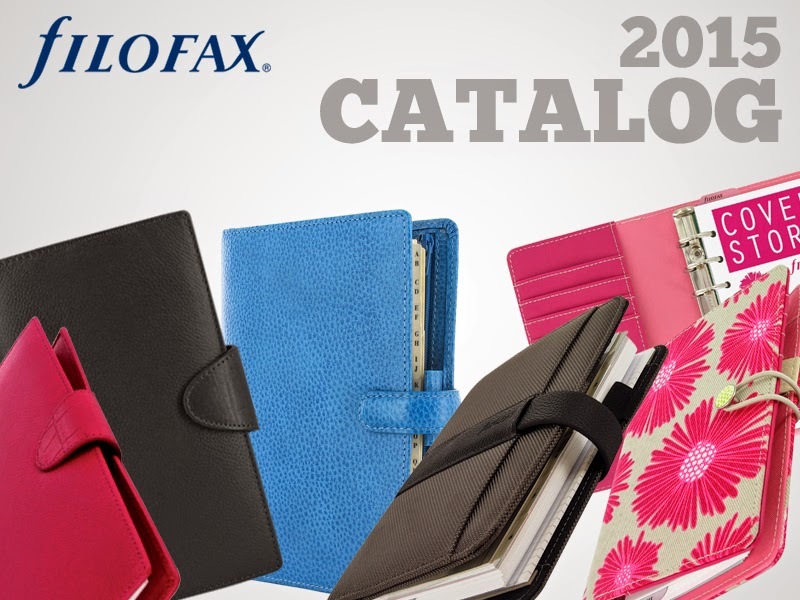 But, here is a compulsory craze if you happen to be a dedicated Filofaxian -- a small peek-a-boo into the Filofax Catalog for the coming year 2015. You will be wooed, take my word! Seize this moment to find out what’s in and what’s about to be out. Explore the future trends and indulge in the vivacity of upcoming colors. Think of Electric Blue Finsburry or Poppy Red Saffianos; Filofax Original in Navy or Cobalt Blue Penny Bridge. Cheer for the comeback of Domino. The wait seems long, but definitely worth it. Nevertheless, we can hardly deny our love for our old allies as much as our excitement for new arrivals! Check out if any of your old Filo-friends are revisiting you. In their company, you are bound to let your thoughts loose, -errrmm- I mean, get organized! Thanks! to Filofax for its boundless supply of organizers, journals, accessories and parallel revolutionary products; our infinite desires never perish. A Bigger Thank you to all our customers for pre-orders with Pen Boutique. We appreciate your interest and patience. For those, who want to hold a spot, it isn't late yet but might be soon. Blue Is The New Black: Depicts The Pair Of Permanent Inks From Montblanc! It was late 2013, when Montblanc introduced two permanent colors to their chart of ink colors, Permanent Blue and Permanent Black. With Montblanc Midnight Blue no longer listed in the permanent category, this pair can be greeted as a farewell souvenir. If you are having a hard time choosing the best ink for your journals and documents, allow Pen Boutique the pleasure of making it easier for you. So, the two new permanent inks, Permanent Blue and Permanent Black - both of these new inks are ISO 14145-2 certified. With no compromise on the quality, you can purchase the quantity of 60ml at a fair price of $28, whether you go for the Montblanc Permanent Blue Ink Bottle or Montblanc Permanent Black Ink Bottle! This time, Montblanc Ink bottle has received a little variation in the branding. Unlike the black box with a faded impression of MONT BLANC text and the color label; both the box and tag on the bottle has turned white. The texts on the box are the same color of the ink that the bottle holds, might even be imprinted with the same ink, who knows. However, the change has been limited to the graphics and color only as the Mont blanc ink bottle still possesses the same hump and two part filling arrangement that sets it apart from its contemporaries. The expiration date on the label makes sure, you write more. Included with the Montblanc Permanent Blue and Montblanc Permanent Black, is Midnight Blue and Mystery Black shades of Montblanc Inks in the review to follow. There is nothing but comparison that will give you a better understanding of the dissimilarity that distinguishes the new collection of permanent mont blanc inks from the previous ones. The demonstration of the montblanc ink colors was assisted by the Montblanc Meisterstuck LeGrand Gold trim Collection Fountain pen. We tried little bit of each color to give you a sense of the thickness and the viscosity of these inks. The first sample of Permanent Blue illustrates that the ink is pretty thick. With a heavier ink flow, the color is intense and deep. The next one to go on the floor, Montblanc Permanent Black stood by its promise to deliver a rich profound black shade. It writes on the dry side like permanent inks are expected to (effectiveness of drying will be discussed further later). Also, mont blanc midnight Blue and mont blanc Mystery Black were given a try. Though, they are not much new to us; they might be out of stock pretty soon, stock up fast if you love them. You can easily tell the difference between the Regular Mont blanc inks and the Permanent Mont blanc Inks - that the thickness itself is very much noticeable. The color of Montblanc’s Permanent Black and Permanent Blue is deep. Having said that, it’s a delight to witness how fast it dries. A swipe over with a tissue immediate after the ink comes in contact with the paper fails to smear the Permanent ink colors whereas Montblanc midnight Blue and Mystery Black were easily prone to this test. However, the Mystery Black did not smear as bad as the Midnight blue. But, the focus here is on the Permanent Montblanc inks – Blue and Black, who both perform well with a very less feathering and a low average drying time. The mont blanc inks were given a Windex Spray and the excessive liquid was blotted out. So, here is how it turned out. The Permanent blue stood out above even the Permanent Black- which started to run off the paper along with Windex. The blue did not. It is actually permanent. The mont blanc Midnight Blue and Mystery Black definitely didn’t stand up to the Windex Test. A little bit of water was run across the four similar shades of Montblanc inks when dry. As you can see, just with water, the ink starts to smear on its own. With the help of paper towel, the extra water was blotted out and the reaction with water was comprehensible. The answer is right below. Montblanc Permanent Blue holds strongly onto the paper, doesn't smear, doesn't feather out. It stands up to the water resistance test. Montblanc Permanent Black did start feathering out but comparatively it’s still better than the montblanc Midnight Blue and Mystery Black. The latter ones didn't just perform ill against water or Windex but partly dissolved and disappeared with water. Montblanc Permanent Black and Montblanc Permanent Blue offer you the supreme value for your money. For more information on Montblanc Permanent Black and Montblanc Permanent Blue; Watch the video below or visit www.penboutique.com. A travel companion who is fun, strong, vibrant and flexible; meet the durable and affordable Lamy Safari. Available in wide choice of nibs and colors, Lamy Safari easily fits in whichever category you want it to; Be it Everyday Pens - Luxury Pens - Fine Writing Instruments – Gift Pens – Ink Pens; simply because it’s one of the best pens from LAMY. Comfortable to hold, efficient to write with, a sense of balance, easy cleaning, and hassle free refilling, the Lamy Safari is the pen that can compete well with the pens you buy twice or thrice its price. Not a style statement but definitely an invariable must-have! In the course of my never ending quest for acquiring one of the best writing instruments, I came across the perfect one! A German migrant, the Lamy Safari is designed through experience gathered from around the globe, which must be how it promises such a joyous ride through the writing world. I must admit that it is pleasant company to have. 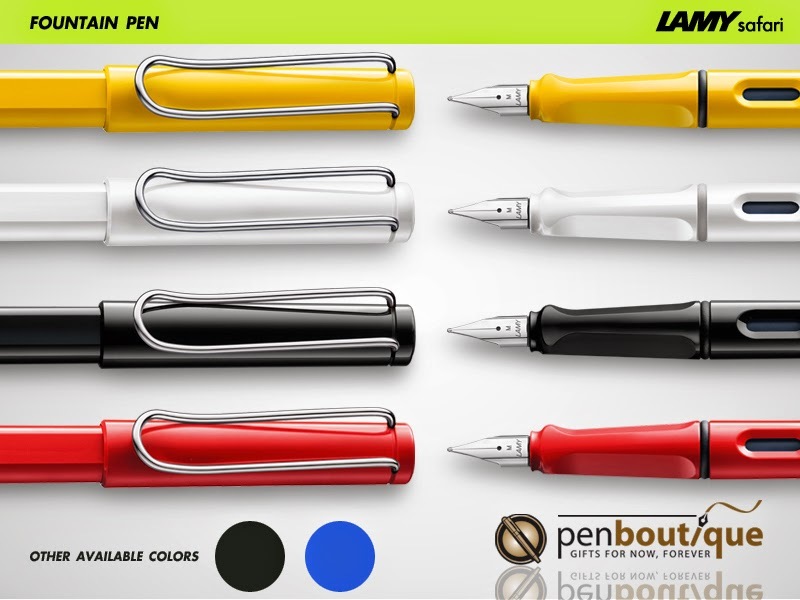 Lamy was a pioneering force behind the use of molded synthetic plastics and they have continued that legacy to this day, providing a sturdy design that is both physically strapping and a nod to those who are minimalists. I have found it to be quite durable. But the best part is the color palette: black is classy, pink is perky yellow is bright, red is glamorous and white is so pure; making it a difficult decision on which is that ONE color you want the most, each one of them being as alluring as the next. With the attractive row of colors, a few special editions, the characteristic design and the ergonomics, the Safari is the best selling member of the Young Writing Family by Lamy pens. Let’s take an overall look at this series before we break it down (not literally of course!) for an objective view. The grip is ergonomic, denoting a scientific approach to a pen designed to meet your needs, your likes and your style of use. I would say this is a carry-wherever-you-go kind of writing instrument, the kind that is tricky to find. The appealing metal clip holds on to your pocket, or your backpack, or your organizer while at the same time safely keeping you away from the much maligned but omnipresent unknowingly-there scratches to your skin, clothing, or whatever you may be carrying that day. Designed by Wolfgang Fabian, the Lamy Safari writing instruments series is comprised of matching Fountain Pens, Rollerballs, Ballpoints and Mechanical Pencils. The Lamy Safari has always been described as the best pen for new entrants to the Fountain Pen world. With an amazing choice of nib sizes, colors, inks, a surprisingly inexpensive cost, and ease; this is not just a good choice for starters but a wonderful tool in the repertoire of even the most practiced pen-aficionado. With a sturdy plastic body, characteristic front section and flexible clip of shiny chrome, the Lamy Safari Fountain Pen features a steel nib and is compatible with a converter filling system or ink cartridges. The use of a fountain pen, as fascinating as it might sound, is equally intricate. The Safari fountain pen eases users into the experience with its wide array of options and variety of ink colors. Enriching the Lamy Safari series with yet another incredible experience of quality writing is the Lamy Safari Rollerball Pen. Focus your effort on creativity rather than on keeping pressure between pen and paper. Matching with the Fountain Pen build, the Lamy Safari Ballpoint Pen sports the same look and feel that makes the Safari series stand out. For the student in a classroom or for the on-the-go traveler; for a short scribble or full page writing, this retractable, lightweight, well balanced Ballpoint from Lamy can be the ideal selection. 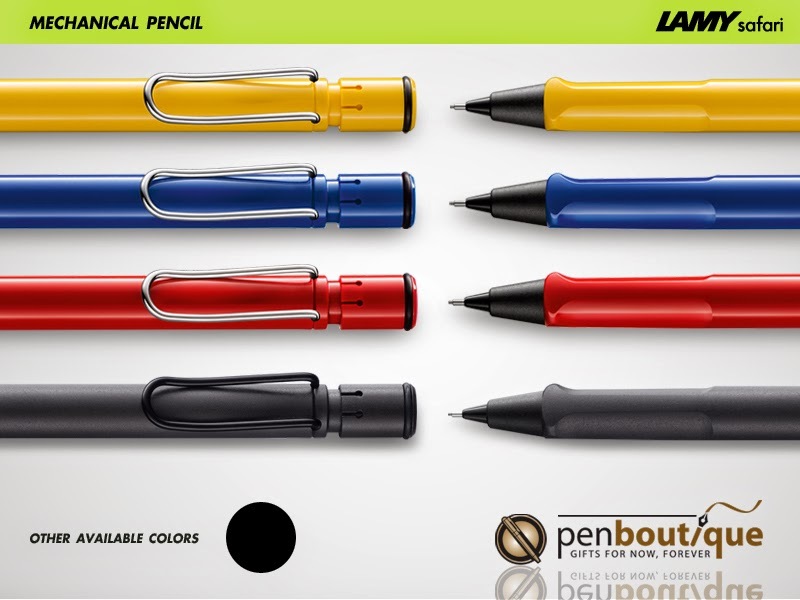 The Lamy Safari Mechanical Pencil completes this series of fine writing instruments. This piece utilizes 0.5 mm lead (Lamy M41) and includes a Lamy Z18 Eraser (Eraser Refills available too!) with cleaning needle underneath the removable cap. Stylish looks and design and fantastic performance is what these Mechanical Pencils are synonymous with. 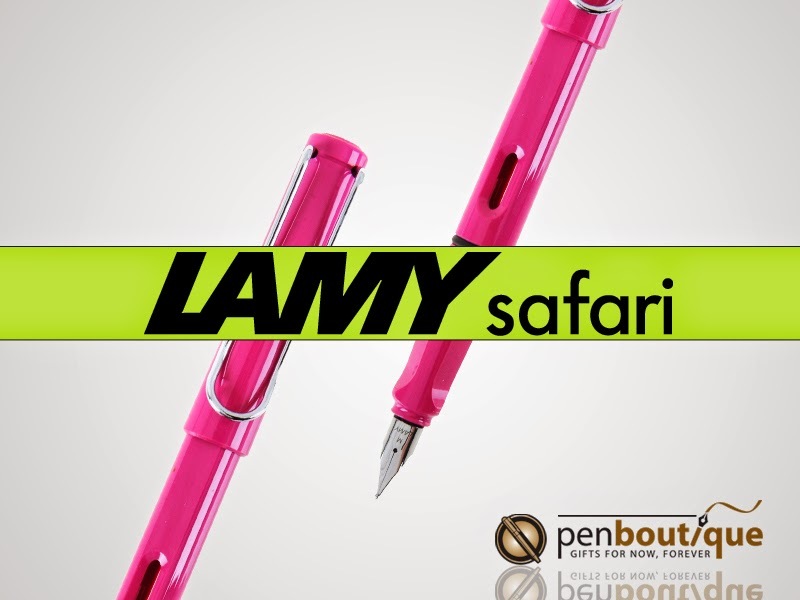 For the collector and enthusiast, Lamy has released a number of Special Editions in the Safari line. The latest color, Neon Yellow, is a new fashion statement in writing styles. It is available in all but the Mechanical Pencil. The first thing you will notice about the Lamy Safari is how good looking it is; it may be the shiny smooth finish or the non-sparkly matte touch. The colors are trendy, desirable and brilliantly flashy yet elegant, distinguishing it from any other regular pen. The large LAMY logo on the lower section of the body and embossed GERMANY at the very end endow it with distinctive character. Add it to your collection of personalized pens with a private engraving to the resilient body, if you desire. Going by the historical approach, the Safari was designed and produced in 1980 with ABS plastic making it especially affordable and durable for students. This accounts for its different colors as well. The pen still is still loved by all. This proves how timeless and future-proof of a design the Safari enjoys. The barrel of the Lamy Safari Ink pens is designed with an ink window to provide the user an easy way to view the amount of ink left. The cap for both Fountain and Rollerball Pens is accompanied by the shiny smooth metal clip, which is located at the top of the barrel on the Ballpoint Pen and Mechanical Pencil also. The facets on the grip section are simple, plain and well-crafted for a perfect hold of the pen that you will never want to let go of. The facets are designed to be used by both left and right handed writers. The Safari is made of perfectly molded ABS plastic. Plastic may not sound like a superior material for a pen but just keep that thought aside until you see the body of Lamy Safari. The construction is smooth and clean. The cap clicks in place with ease and the button for the Ballpoint and Mechanical Pencil is faultless. The Fountain Pen is comprised of 4 pieces - cap, body, front section (including the feed), and the nib which is removable/replaceable. While the Safari may not rise to the same expectations you would have of a Montblanc or Visconti, they are not meant to compete with such luxury pens. Instead, the Safari is meant to give you a high quality. Its a well made, durable pen that is a fantastic writer but won’t break the bank. If you are a fan of lighter pens, try using the Fountain and Rollerball pens without posting the cap on the back. The Safari is virtually like a feather weighing approximately 17 grams. 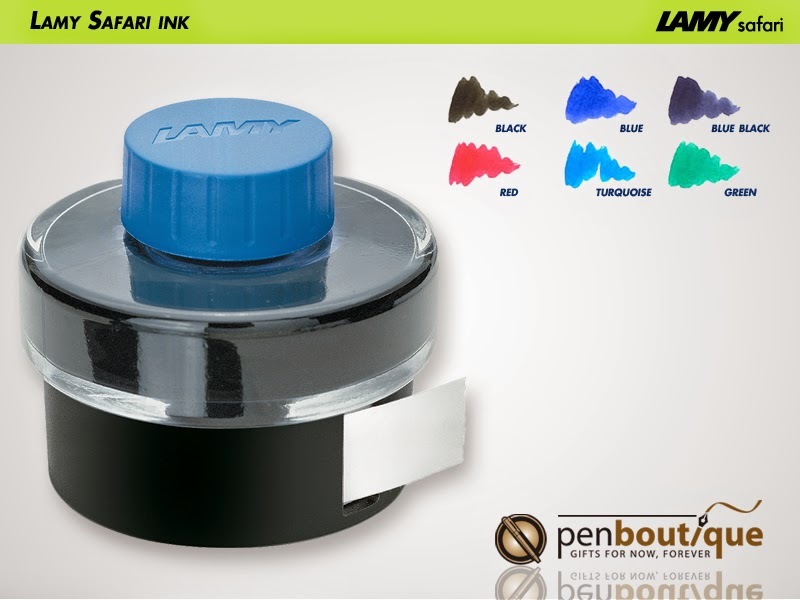 The Lamy Safari Fountain Pen is a cartridge/converter pen which is the most flexible of the different filling systems. Every fountain pen fanatic has used a pen like this at one time or another. Like other products from Lamy, the Safari uses a proprietary Lamy ink cartridge (T10), one of which is included with the pen. A Lamy Safari Fountain Pen converter (Z24) is not included in the box but can be purchased separately. Lamy Ink Cartridges are available in black, washable blue, blue-black, green, red, turquoise and violet. These will fit all lines of Lamy fountain pens. 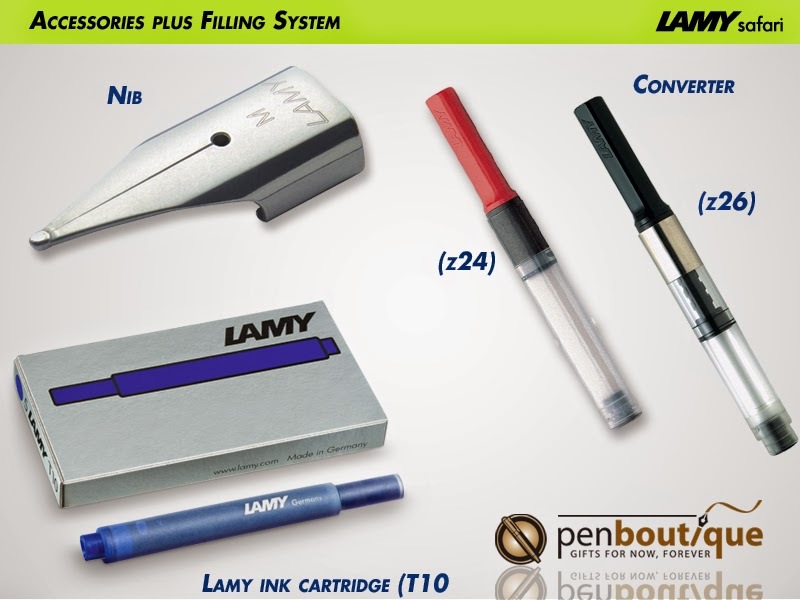 We strongly recommend using Lamy brand ink (T52) with the converter filling system. While filling the converter, make sure the whole nib is immersed in the ink and that you don’t spill it over the lip of the bottle! 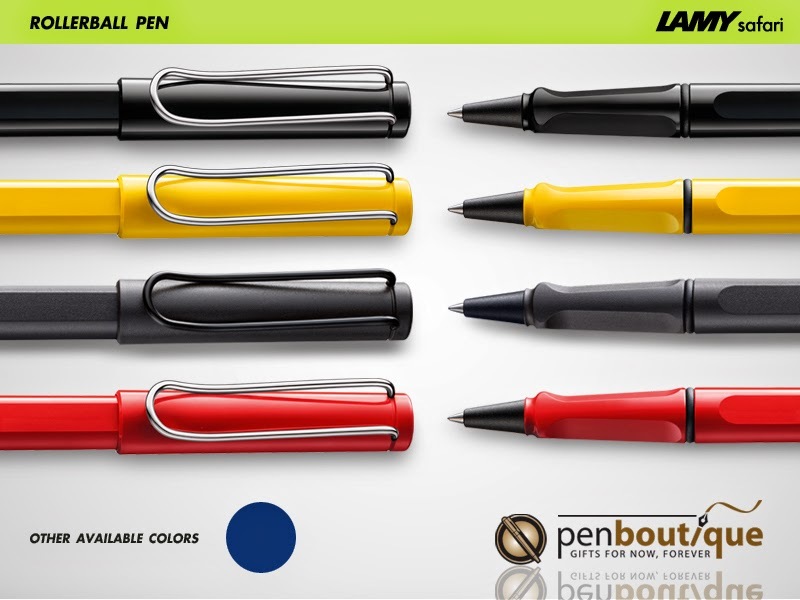 Lamy Rollerball refills are available in black, washable blue, green and red. 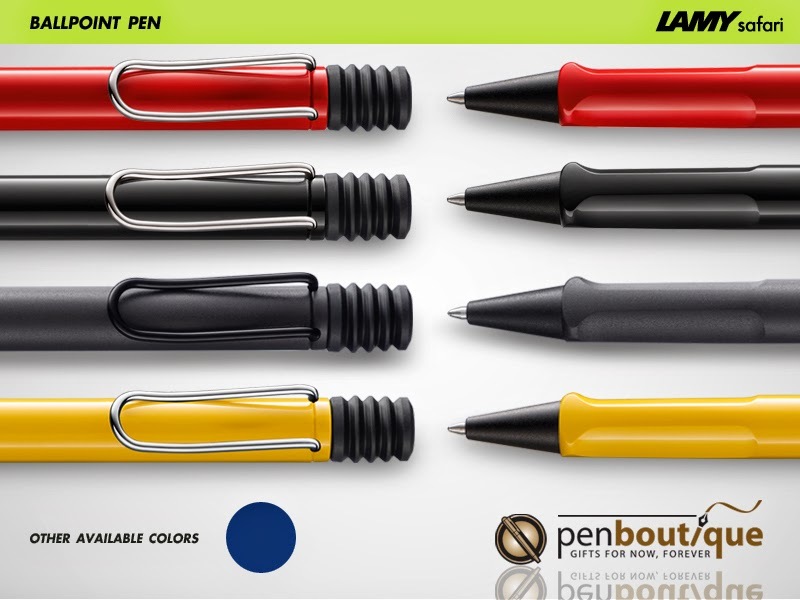 Lamy Ballpoint refills are waterproof and available in black, blue and red in the either Fine, Medium or Broad; Green is also available, though in Medium only. 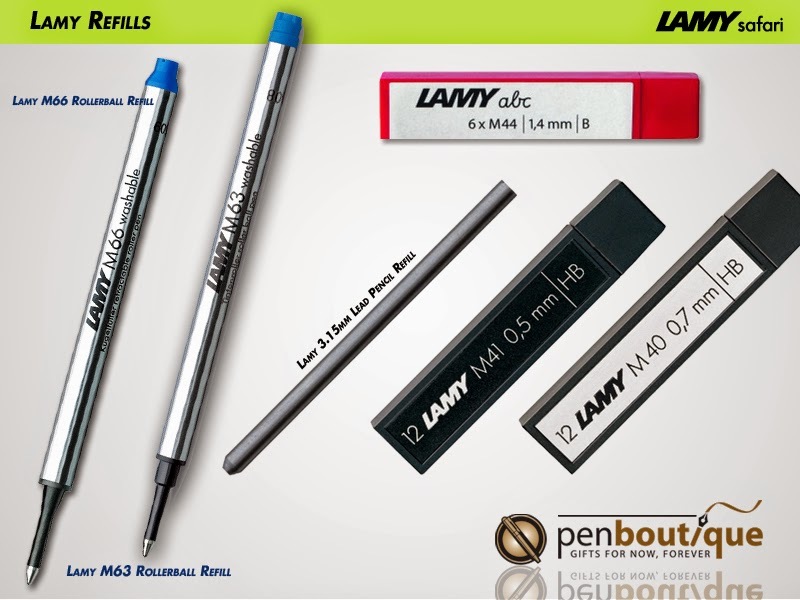 Lamy Pencil Lead refills come in 0.5 mm size with and HB lead hardness. 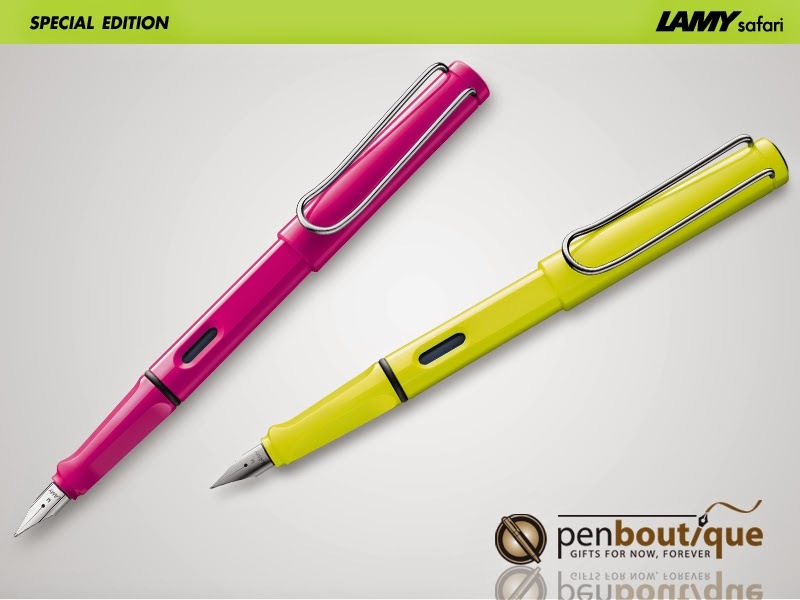 The Lamy Safari is a writer which is balanced, light and smooth. The nib is made of stainless steel but glides well across the paper, leaving no scratches or issues with skipping. While steel nibs tend to be stiff, there is some line variation noticeable in the larger nib sizes. Unlike some pens, the Safari is not adversely affected by writing angle. Write fast and it will and keep up with you; but stop for a moment and you may develop a drop of ink on the paper. Nevertheless, ink flow is constant and that’s a good thing. The Lamy Safari is always ready to write whenever you want. With the material so resilient and colors so trendy, you will want to use this pen again and again. This can be your everyday pen that is able to do the job on demand. The 4 piece construction of the Fountain Pen allows for very easy cleaning. Some users have submitted their experience of rinsing with water, which in our experience works well. The design of the Safari allows those who follow the strictest cleaning regimen to easily detail clean their pen, even if there is something stuck between the nib and feed section. The interchangeability of nibs is swift and hassle free, though I must add not ink free! • Classic Lamy look may turn off some users. Since it’s made of ABS plastic, it may lack the gloss and shine of other luxury fountain pens. • The difference between the EF nib and F can be hard to discern. So after going through all the good and bad (mostly good!) points of the Lamy Safari’s character, I am happy to conclude that this pen is one of the most reliable and durable pens that you can throw in your pocket or backpack and still expect it to write as well as it does. Leave the Fountain Pen at your desk, pick it up after a week and you are bound to be amazed at how well it will start right where you left off. No drying out, no skipping, nothing. If you are a beginner with fountain pens, you are going to love it. If you are not, you are going to love it even more. Try out new inks or new writing styles with the easily switchable nibs. 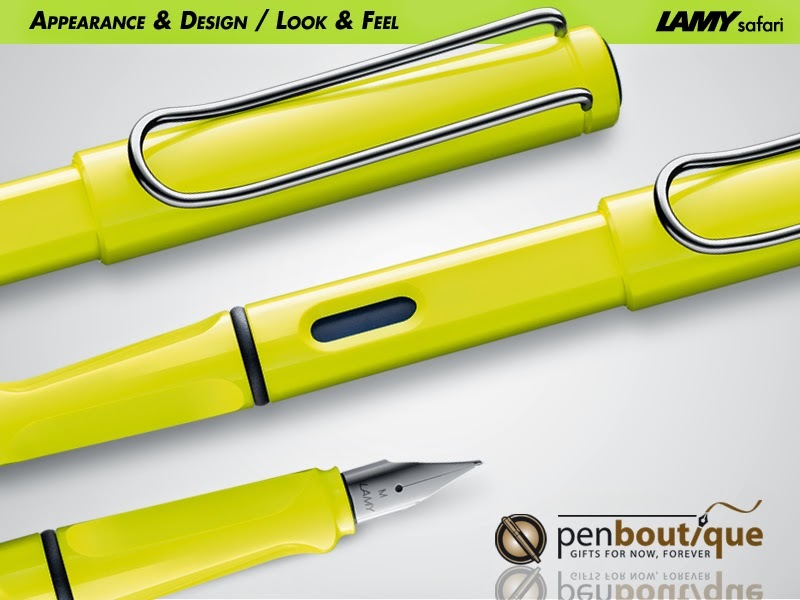 The fine writing experience at such a great price is something that only the Lamy Safari can promise you. Well, short and sweet, I’m going to say that the Lamy Safari is a pen that everybody should add to their collection, for the fun of writing.